Today was a great day. Freida had us put away the projects from yesterday and design our own project from the pictures we brought. Last night we had to complete some sketches from our pictures. I did two tree sketches that I really like, but to be able to complete the process in a day, I selected the easier one, duh.... 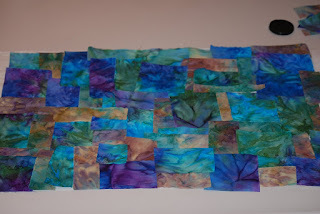 Anyway, when I started placing the fabrics for the sky, I really liked the way it was developing, so I lost the idea for the ground and just did a beautiful blue, green, tan and purple fused background. 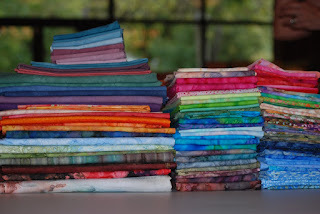 It is always hard for me to start of selecting fabrics, I always end up changing my mind 100 times. This one turned out way different than I first expected. After I was real happy with very excited about the background it was time to audition the tree fabric. 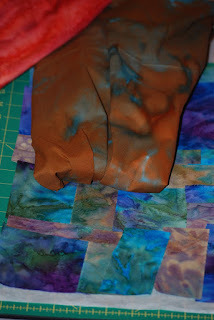 This was just as hard as the background, but once I layed down the brown and turquoise fabric, I was pretty sold on it. This is one of Frieda hand dyed pieces and it is just beautiful, it actually looks like leather with turqouise layed on it. I just love to hold it! The pink fabric you see in the corner is the fabric I picked to be the oak leaves of the tree. I'm anxious to finish this piece after I get home. It is really going to be stunning in my entry way! Tomorrow will be our last day, Frieda is going to have us quilting all day and learning her techniques for beautiful and fluid quilting. 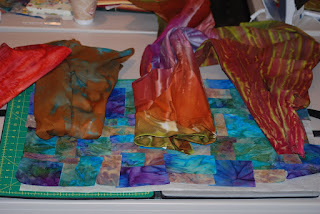 Today she gave us a slide show of her studio and quilting examples. It was a great time today. This group of ladies are the best. We have ladies here this week that are doctors, lawyers, CPA's, retired and fiber artists. All very supportive, genuine and challenging themselves to use the right side of the their brain!